Information on this is difficult to find: I appreciate any comment, any correction. You may do this at the bottom of each page. Thank You! They must always choose a speed that allows them to stop comfortably, on their own side of the road, within the distance that they can guarantee to be clear. click any chart to enlarge. Please note that some data may be out of date. The laws in Europe are different for every country. Some countries allow having a radar detector in your possession but not using it, while in others it is even illegal to hold them. For a discussion and a world-list, see Wikipedia. Errata: In Norway they are legal to own, sell and buy, but illegal to use. Gocompare – Harsher Penalties. 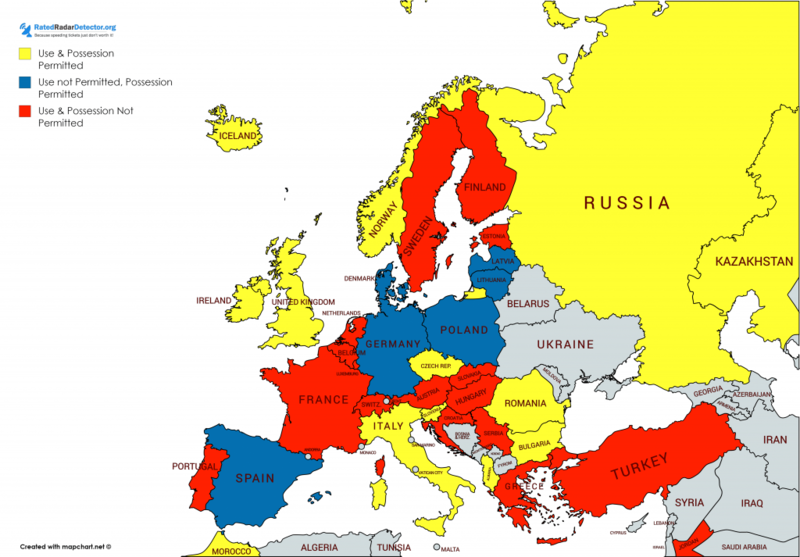 Traffic fines compared across Europe. And even Australia, Canada and the US. A goldmine of data and charts. All based on relative incomes. AA – Touring tips Touring and traffic advice on even more European countries than covered here. Recommended. Canadian report (Review and Analysis of Posted Speed Limits and Speed Limit Setting Practices in British Columbia). This is a must read. A brilliant discussion on speed limits and their impact on human behavior and accidents. They have also published Submission for the Raising of the Motorway Speed Limit. On November 7th 2014 the EU adopted the Cross-Border Enforcement Directive. Drivers in most European states will see fines for some driving offences committed abroad sent to their home country. The directive covers eight offences: Drink driving, driving under the influence of drugs, speeding, running a red light, not wearing a seatbelt, motorcyclists not wearing a crash helmet, driving on the hard shoulder and using a mobile phone while driving. Foreign offenders will be fined the penalty payable in the country of the offence, even if fines vary across Europe.There is, however, no formal procedure to force payment at the moment. And the UK, Ireland and Denmark chose to not sign the treaty. Also it needs to be remembered that this procedure is in place only for automatic offences that occur (such as a speed trap). In other cases the driver stopped will be required to pay in cash. A friend of mine got some speeding tickets in Italy lat year. He has already paid half of them, but as they are quite expensive, he has still 2 to pay. He is traveling back to Europe (Germany) this month. His main concern about this is whether he has to paid everything in advance (prior to entry the UE) or he will be fine just by presenting the already paid fines?. If he doesn’t pay all of them, will he get any penalty at migrations or customs? I know Morroco is not Europe, but just in case you were going there.. ;-). I did 1300 km there recently. The traffic is quite civilised as for an African countries. It gets a bit more tricky in the cities, but still compared to eg. Egypt it’s Europe. Locals respect most of traffic rules except some speedlimits (which do also do not respect, right ;-). If you are used to driving in Central/Eastern European cities (or Paris, Rome etc. 😉 ) you’ll be fine there. The speed limits are 60 city, 100 country, 120 at the highways. Drivers do not follow them strictly, but haven’t seen anybody going very fast (I think I got overtaken twice and I was driving a Fiat Panda ;-). The different thing is with speed limit signs. On the roads you may meet ridiculous speed limits like 20kmh on a major road only because there is a crossroad where you have a priority. Nobody respects that limits. I even made a picture of myself going 150kmh at that 20 kmh limit while the locals weren’t slowing down there from their speed. I haven’t seen any speed control nor speed cameras, but the locals told me that they happen. There are however police controls usually in well known and visible places. You need to slow down and pass through or stop if they show you to stop. The police I met was very kind and respectfull to me. Opposite to most locals they spoke perfect English. The roads that are newly built are of good quality, but older once maybe worse. The colour of the road on the map may not be the right indicator. It’s better to ask locals or the police. I was shown a grey road (dirt track) on the map which was a beautiful asphalted road through Altas mountains and was warned agains a good looking yellow road on the map (secondary, asphalted road) that was supposed to be in a terrible condition. Generally it is drivable country with some magnifficent views in the mountains and at the desert. One more thing. Be careful at the roundabouts. The Morrocans drive through roundabouts as …there was no roundabout = as straigh as possible. So if there is a 2 lane road approaching a roundabout you may be sure that the driver on the right lane will change lane to the left and back to the right while going through the roundabout without using a blinker or looking at the mirrors. What’s up to all! I’m grateful for this website. Tons of useful information, knowledge is power in the “speeding” industry. Although I haven’t found anything about radar detectors? Like where do they are allowed and where not? Thank you! This map is now included above. MALTA In Malta you have roads in a worse condition than in most places in Europe, but still you can drive them. They are bumpy, curvy with uneven, often broken tarmac. The speed limits are 50kmh in the city and 80 kmh outside, but the roads are so curvy and so poor that it is not that easy to go much faster. There are some speed cameras on main roads but not many( I’ve seen 2-3, some say that they are 10 and measure average speed). There is a lot of police but it’s probably not the traffic police (seen 1-2 controlling cars). The driving style is something between Souther Europe and Middle East. If there is a place in front people move on but rather slowly, respecting the priority rule when they realy feel you are not going to stop and yield. They drive slowly but may turn with no signals, use 2 lanes instead of one. As it was outside Europe a ‘highway’ does not necessarily mean dual carriageway with no crossings. The local roads may have ony 1 lane (in both directions). Often you have an impression that you are driving into somebody’s farm while actualy driving along a major road. I don’t know what are the fines for speeding unfortunately, but I do not thing there is a big chance of getting a ticket. Speed safely and don’t get caught! Here are the regular fine. the law allows to give you a fine up to CHF 1’000’000.- and up to 4 Years prison in that case!!! the fine in swiss are really expensive when reporting of an offense! so Switzerland is a great country to enjoy the mountain roads. But the police and law are insane!!! each additional 5 km/h gives another +25 Eur of fines. I would like to know where i can fine the stats of how many traffic fines get issued in Europe or even better in every country in Europe i have looked around but havent found a solid indication what the numbers are, any help would be great thanks. Good idea. I’ll try to find numbers for Poland. In some regions police even have targets for fines (each policeman has to fine minimum given number of drivers one each patrol…..). Insane! Even policemen complain about it. I’ve had a look into statistics for Poland, althought I thought it will be easier to get to. In 2017 the Police issued 3 594 405 traffic tickets until 26 Dec (I do not know why they are doing this stat that way). If you assume that it is roughly 10.000 per day and Christmas period is a busy one for the Police I would say it makes around 100.000 more = 3,7 mln in 2017 (for aroung 4,4 mln traffic offences). It was 150.000 more than in 2016 so you may count 3,55 mln in 2016. I do not have the split but most of them were for speeding (that’s where I am 😉 ), then failure to give way, then offences against pedestrians. 2015 I do not have. In 2014 there was 2,5 mln tickets (1,5 mln speeding, 400k seatbelts, then overtaking). The nation all together is around 38 mln people (+0,5-1 mln migrants), 28,7 mln registered vehicles (including 22 mln passenger cars) although even 10 mln maybe actualy scrapped – around 18 mln on the roads. Difficult to find how many peopple have driving license, probably over 20 mln. 2017 fatalities 2800. Hope that helps. up to 110km/h: +15km/h is allowed by the cameras. 110-130km/h: +20km/h is allowed by the cameras. Info is from a police friend. My tempomat is set to 156km/h, that is 149-150km/h @ GPS. I haven’t received any fine for the last 7 years. Hungary (besides Bulgaria and Romania) is one of the few major European countries syill missing from SpeedingEurope. Do you have any idea of where I can find more information on Hungary? Where did you find the information that Bulgaria and Romania has not signed the agreement? Not certain what you mean? Terje, I know that it is Speeding Europe, but maybe we should have another subpage along with Europe and specific countries, that would be titled WORLD where we could share some info about non-European countries? What do you think? Oman. * I know that Oman is in Asia, not Europe, but just in case somebody was interested.] In Oman you have roads in a great condition, often better than in Europe. Wide 2-5 lane highways, even country roads. It would be great if only: 1. some m….s put a speed bump throwing you up in the air in places you wouldn’t suspect them to be; 2. somebody didn’t put a speedcamera every few kms. 1. Speedbump in the Oman, similar to Emirates means something different than a speedbump in Europe. In Europe if you have a speed limit of let’s say 30kmh and a speedbump, you may most of the time go 30kmh and don’t experience a lift off while driving over the bump. It’s a for of saying ‘do not go faster than the limit’. In the Emirates you often have a 80 kmh limit just before the bump, but trying to drive over it at 80 kmh will give you an unexpected flying lesson (and you suspension will probably loose some parts)! The bumps are terrible and the only way to go smoothly over them is to stop in front of them or slow down to max 20kmh regardles what speed limit sign stays 20 before. 2. Omanis started following the anti-speeding hysteria recently. On some roads there is no speed cameras, on some they are everey 1-5 km there is a speed camera! The tolerance is from 10kmh over the limit to 20 kmh over the limit. The penalties are SAID TO BE VERY LOW! There is however a lot of police. My advice: follow the locals. If they speed over 10 kmh it means that the pictures are done at 11 kmh and above, if they go 19 kmh it means that you can also do so. The good news is that THERE IS NO INFORMATION EXCHANGE BETWEEN OMAN AND EMIRATES. So if you rented your car in Emirates and went to Oman you can make yourself feel like a star in flashlights, being photographed by paparazzi (ok, not realy ‘speedcameras’ 😉 ) and come back to Emirates without having to pay anything. As in many places outside Europe a ‘highway’ does not necessarily mean dual carriageway with no crossings. Dual – yes, crossings maybe, so may be speedbumps, roundabouts etc. Watch you fuel! In urban areas you have gas stations every few dozen km, but if you drive out to the desert you may not see one for eg. 200km. If you are going there take a lot o water with you also. Emirates. * I know that Emirates are in Asia, not Europe, but just in case somebody was interested.] In Emirates you have roads in a great condition, often better than in Europe. Wide 2-5 lane highways, even country roads. It would be great if only: 1. some m….s put a speed bump throwing you up in the air in places you wouldn’t suspect them to be; 2. somebody put a speedcamera every few kms. 1. Speedbump in the Emirates means something different than a speedbump in Europe. In Europe if you have a speed limit of let’s say 30kmh and a speedbump, you may most of the time go 30kmh and don’t experience a lift off while driving over the bump. It’s a for of saying ‘do not go faster than the limit’. In the Emirates you often have a 80 kmh limit just before the bump, but trying to drive over it at 80 kmh will give you an unexpected flying lesson (and you suspension will probably loose some parts)! The bumps are terrible and the only way to go smoothly over them is to stop in front of them or slow down to max 20kmh regardles what speed limit sign stays 20 before. 2. Unfortunately Emiratis follow the anti-speeding paranoia and the do it their way. Everey 1-5 km there is a speed camera on pretty every major road! The tolerance is from 10kmh over the limit to 20 kmh over the limit. The penalties are supposed to be high! My advice: follow the locals. If they speed over 10 kmh it means that the pictures are done at 11 kmh and above, if they go 19 kmh it means that you can also do so. It seems that there is worse in Dubai and it gets more relaxed while driving south. Es in many places outside Europe a ‘highway’ does not necessarily mean dual carriageway with no crossings. Dual – yes, crossings maybe, so may be speedbumps, roundabouts etc. Watch you fuel! In urban areas you have gas stations every few dozen km, but if you drive out to the desert you may not see one for eg. 200km. If you are going there take a lot o water with you also. In Jordan you have roads in a worse condition than in Europe, but still you can drive them. Some are nice and even, some feature rough surfaces.The good news is that, there is very few speed cameras. The is A LOT OF POLICE standing on the shoulder of the road or some special post along the road,but most of the time THEY ARE NOT ABOUT SPEED. They’re more interested in terrorist stuff and general safety. Es in many places outside Europe a ‘highway’ does not necessarily mean dual carriageway with no crossings. Dual – yes, crossings maybe, so may be speedbumps, roundabouts etc. The problem is often the quality of asphalt. On Desert Highway, most of the time is more than rough in many parts. My average speed on the highway was slightly above 100 kmh. People drive in a very relaxed manner. They generaly do not use turn signals. Just slowly move to the other lane. I don’t know what are the fines for speeding unfortunately. The Czech republic is relatively free country by money fines but generally strict by drive forbiddens. In Czech republic was introduced point system. Every driver start with zero and if collect 12 points then lose license for 1 year – no chance give them back after half. The point system also apllies for foreigners. If you don’t some point violation for 1 year after last point violation administrative officer delete 4 points from your account. Driver can also attend a certificated slide school at certificated location and delete 3 points each calendar year – it costs about 4.000 CZK (154 EUR) but driver mustn’t more than 10 points on account and on the training day no one for 6 and more points. 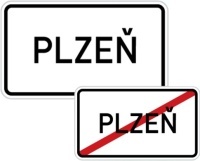 Standard speed limits are 50 km/h in villages/cities (by IP 12 a and IS 12b signs – http://www.bezpecnecesty.cz/data/web/dopravni-vychova/dopravni-vychova-znacky-obec.jpg), 90 km/h outside urban areas, 110 km/h on speed roads (http://www.pneu-poradna.cz/sites/default/files/silnice.png) and 130 on motorways (http://www.pneu-poradna.cz/sites/default/files/dalnice.png) – speed may be reduced for unlimited km/h but increase to maximal 30 km/h above standard limit and only in towns. Other special speed limits are 80 km/h on speed roads and motorways in urban areas, 20 km/h in residental and pedestrian zone, 50 km/h 50 m before train crossroad – with white flashing and 30 km/h 50 m before without this (warn sings are plant 240, 160, 80 meters before rail track), 50 km/h if you use snow chains,. Radar detectors are legal but laser jammers cause 5.000 – 10.000 CZK, no points, drive ban – many rich peoples have it, but policemans may measure speed by pasiv machines like PolCam 2006, Travimo Gesig, Minispeed 2000 (only compare speed with suspicious driver and start 100 m – 9999 m sectional measurement). Measure cars are almost always hidden – Škoda Octavia III 2.0 TSI 4×4 80 vehicles – active radar, Škoda Superb II facelift 18 vehicles – pasiv and 3 radars, Volkswagen Passat B6 R36 16 vehicles – pasiv – but most are K.O., Volkswagen Passat B7 20 vehicles – active radar, and others mostly Škoda Fabia I, Škoda Octavia I, II, II facelift – active radars, 3x Ford Mondeo ST 220 – pasive – thats all. And always have dark rear windows, obviously long antenne – only shorter have new Octavia III. With police car measure with laser on 3 legs stativ and from car with new LaserCam 4 and sometimes TruCam. Stationary speed measure is new “cancer” who comes with new amendment to law. It added new practise of the administrative officer process and courts that user/owner of car is responsible for all offenses that someone do with his/her car unless the driver allow that drove concrete person. It could apply on speed, drive on redlight by automatic technical device used without operator and if policeman catch forbidden parking but doesn’t catch driver. Most segmental measurements are well-visible using calibration lines on the road and cameras above the road. A warning is also common, but it isn’t require by law. Sometimes it is also measured from radar in roadside boxes or induction loops in the road. Warnings on stationary measurnments in navigation are allowed. Second is 6-19 km/h above in urban areas and 11-29 km/h outside urban areas => the same money fine but +2 points. Third is 20-39 km/h above in urban areas and 30-49 km/h outside urban areas => to 2.500 CZK/96 EUR + 3 points (generally 1.000 CZK/37 EUR – it depends on what policeman you encounter + his mood and your behavior, in ideal by law it is may on conditions – traffic, weather, pedestrians, cyclist…) or 2.500-5.000 CZK/96-192 EUR in case of disagree in administrative officer process also 3 points and 1-6 months driver ban warning if you do the same thing in to 1 years after firstly (chance to give them back after half). Fourth is 40+ km/h above in urban areas and 50+ km/h outside urban areas => it could be solve only in administrative officer process for 5.000 – 10.000 CZK/192-384 EUR, 6-12 months driver ban + 5 points (chance give them back after half). Policemans apply standard tolerance – 3 km/h for speed up to 100 km/h and – 3 % of 101 km/h and above. You have two chances – pay smaller penalty on the spot or higher penalty and 1.000CZK for administrative officer process. If you don’t agree with offense, you may (aspecially for foreigners) have to cash bail 3.500 – 50.000CZK/135 – 1923 EUR but it could be if maximal tax for traffic violation is 5.000 CZK/192 EUR and more + amount of the deposit mustn’t exceed of maximum amount of the fine that can be imposed for the offense. Police officers sometimes try to keep the driver up and even if he don’t, he raises the fact that he was driving too fast and whether he is willing to pay the fine without any proof. I would like to see the photo, or transfer the case to administrative proceedings. Overtaking forbidden => same restrictions as 40+ and 50+ over speed limits but 7 points. Drive on redlight => same restrictions as 20-39 and 30-49 over speed limits but 5 points. If you don’t use safety belt => to 2.000 CZK/74 EUR on the spot (generally 100-500 CZK/4-18,5 EUR it depends on what policeman you encounter + his mood, in ideal by law it is may on conditions – traffic, weather, pedestrians, cyclist…) or 1.500-2.500 CZK/58-96 EUR in case of disagree in administrative officer process + 3 points. You can’t hold mobil phone or other speech and recording equipment. => same as no lights, but with 2 points. Summer tires has to 1,6mm tire tread pattern and winter tires 4 mm. Winter tires are require from 1.11. to 31.3. if possible ice/snow on the road or there is. 0 promile alcohol tolerance. But if you don’t agree with drink alcohol, you give probably no sanction up to 0,24 promile and from measurment minus 0,24 (for example 0,26-0,24=0,02 proof alcohol in blood) by breath analyzer and 0,2 by blood. 1 proof promile => 1-10 years drive ban, to 1 year in jail (6 monts – 3 years if traffic accident) and 7 points – but mostly financial penalty, conditional jail delay up to 5 years). Actual exchange rate for about 26-27 CZK for 1 EUR. That’s speed tolerance means how much policeman have to reduce from measure speed. But generally state police mostly reduce 13-25 km/h – more in outside urban areas. The city police measure much less but with smaller tolerance. Means if you drive to 105 km/h on 90 km/h, you probably haven’t to stop by police. To je dobre! Thank you for a very detailed decsripion. So, I understand that going 24-29 kmh over the limit on highways and 14-19 kmn in cities should be relatively safe, right? What speed would you say is ok in terms of relatively low risk of being caught and low penalty if got caught? How would you describe, is there ‘a lot’ of speed control in Czech Republic or not? In Slovakia eg. they have a lot, happens to have 6 speed gun patrols in 50 km. In Poland eg. it’s much less. Usually 1-2 in 100-200 km. I answer both of your replies. 1) I recommend for sure +13 tacho (about +9 to +11 real) and drive with smile and relax in urban areas. Outside urban areas i don’t say for sure but sometimes is +15 km/h tolerance, sometimes is +25 km/h – it depends on weather, traffic intensity, pedestrians and cyclist, but i say most on policeman, his mood and his/her chief – hard to say but +20 tacho may be safe everytime outside urban areas. But hard to say, some patrol don’t stop you for 160 tacho on speed, some patrols yes. Especially I always transfer my violation to administrative process (they always make mistakes – if the appeal is written well and in the range of 10-20 pages, you probably always win – i had 6 wins at past), don’t agree with fine on the spot and drive free, relax, safety (look up on situation, no on tachometer) on high speeds. But it requires a lot of skills in practice of the courts and their conclusions and well speak czech. In case of lose you pay more + 1.000 CZK/37EUR process fee and you have one chance appeal with suspensive (in proceedings a regional fines administrative office) but if you too lose you may turn to court – costs 3.000 CZK court fee without lawyer – standardly no suspensive, but on demand mostly yes, last chance is cassation complaint to Supreme Administrative Court – 5.000 CZK court fee and you have to lawyer about for 20.000 CZK. You also risk a cash bail 135 – 1923 EUR as i wrote, especially if you foreigner and you will probably be unavailable for offense office. Second chance is radar detector – absolutely legal and laser jammer – only for 5.000-10.000 CZK – no chance to drive ban and jail – only fine and be aware of hidden pasiv policeman cars – I wrote types in first post. Since the change of the law, when this amount of fines is set, I don’t know about a single case when the police tried to punish (it is time consuming, it is necessary to make an expert opinion, etc.). In the past, when a fine of up to CZK 100,000, I know 2 cases from of the whole Czech republic, when a fine of 15,000 and 50,000 CZK was imposed – but only in Pardubice. 2) Absolutely no. That’s good on Czech republic. There is a one of the strictest point system on the world (and 6-12 months drive ban for 40+ and 50+ speeding, forbidden overtaking) but very low police controls frequency aspecially those who measure speed. Relatively often stop by regular coloured police car and submit you breathe test for alcohol (sometimes in sort of peoples submit too on spit drug test), they also require a driving license, a technical card, insurance card, ID card, sometimes they want to see mandatory equipment, but I do not expect this in the case of a foreigner. In the end – usually happens that no speed control on 300km trip in CZ, but you meet some standard coloured traffic patrols. But you probably meet stationary enforcement – segmental speed measure, redlight detection cameras, radar roadside boxes, induction loops in the road. Thank you very much. Will be some detailed site about Czech republic like a other important countries like Switzerland, Norway, Spain, Finland…? Skvělé! Díky moc! Great! Thanks. Terje I think it is time to have a separate page for Czech Republic. With such a forum member as our Dear Czech Citizen we have more then enough information :-). I also have enough info on Lithuania and Latvia to publish separate pages. Alcohol Tolerance is 0.00%, though the police is CAN (doesnt have to) to tolerate up to 0.03%. Phone operations without a hands-free set is 50€. Overtaking where it’s not allowed: 100€, if you endanger someone 150€, if you cause an accident : Court. Thanks to you, data on Slovakia will be up soon! I forgot to mention this, but we have no point system, however, the police can take away your licence after 3 offenses exceeding 60€ within 12 months period. P.S. : Want me to give you info on Czech Republic too? Do you have any info/links on the fines and license withdrawals? Basically half the fines as for Urban Areas. Licence may be suspended for 2-3 months with speeding over 60km/h. Vehicles over 3,5 tonnes generally gets fined twice as lighter vehicles. There is a point system where you lose your licence after 8 points (3 months). Points are valid for 2 years or 5 years if you have been convicted of drug driving. What happened to the below 60km/h?? Of course. Remember that I am only a one-man-band struggling to update info on a very complex object. You are doing a great job Terje running this site! You are providing a priceless source of information for the people who still want to drive normally (according to road and traffic conditions) and not according to what somebody wrote on a roadsign surrounded by red circle. Is Croatia member state of EU? This is not about the EU, it’s about Europe. Do you have any websites that reference this – preferably in English? which seems to be true. Speed safely and don’t get caught. In mid August I got a notification from my car rental Avis that they have sent my address (I live in Sweden) forward to the French authorities for speeding (no one to blame but me). However 1,5 months later I’m still waiting for the fine from the French authorities. When I call the number Avis provided they just tell me it will come and they cannot give me any specifics on my case. Question: How long does it normally take? I’m getting worried that the letter has been lost or something. I don’t want to be charged the higher fine or have a collector knocking my door for not receiving the letter. I don’t know how to find out. All fines are 50% off and foreigners must pay them on the spot. For locals 50% off in the next 8 days. Drive 61+ km/h in this zone and your licence is withdrawn! I can’t stress enough how important is this sign. It is very rare but you can find it in areas near schools/parks and so on. Best practice is to slow down/stop and shift to 1st gear. Drive 41+ km/h in this zone and your licence is withdrawn! All this zones have a starting and an ending sign. I just got an on the spot fine of €250 for doing 78 in a 50 shortly after crossing the border from Croatia. I just received a notification for exceeding speed limits in Slovenia on February 25th 2017, after more than 1 year from the fact. What is the time limits for notifications in Slovenia? I believe it should be 360 days in European countries. Hello! In Estonia fine exceeding +21 is actually around 120 EUR. Official data in Estonian. Below is short version in English. Measurement mistake is up to 99kmh +-3kmh, 100+kmh is -+5kmh. karistatakse rahatrahviga kuni 100 trahviühikut või sõiduki juhtimisõiguse äravõtmisega kuni kuue kuuni. karistatakse rahatrahviga kuni 200 trahviühikut, arestiga või sõiduki juhtimisõiguse äravõtmisega kuni kaheteistkümne kuuni. karistatakse rahatrahviga kuni 300 trahviühikut, arestiga või sõiduki juhtimisõiguse äravõtmisega kuni kahekümne nelja kuuni. Sorry I’m late with this response but this winter seems destined for a major update to Speedingeurope and new countries. I hope to be able to include Estonia and all the Baltic countries. In the Netherlands an app called “Flitsmeister” got really big very quickly (700.000 users), which warns you for set speed traps (at one point as well as over a fixed distance), traffic distruptions, nearing emergency vehicles and since a while it’s also possible to send in stopped vehicles, bad road state and so on. The makers started adding other European countries too – it now works in almost every European countries (except Switzerland, where it’s illegal – in others radar detectors are illegal, not apps). The Association of Chief Police Officers has made a recommendation that the minimum speeds for prosecutions is the prevailing speed limit + 10% + 3 km/h I.e. 48 = 56, 96 = 109, 112 = 126. This is ONLY a recommendation. Automatic fines have increased to £100 (€125) + 3 points (accumulate 12 points in a rolling 3 year period = 6 month compulsory ban and heavier fines). Speed limit + 30% will not be dealt with automatically so will require a court visit, attract higher fines, 4-6 points and short bans begin to become an option. Speed limit + 45% = minimum of 6 points, higher fines, bans of up to 2 months and heavy fines. Speed limit + 55% = May be considered to be a more serious offence, particularly if there was an accident, which would take this into a much more serious category with long bans, more points, higher fines and potential term in prison. Thank you for this info, RS1200Gs pilot. I will have a look into this. If a driver commits an offence in another country, the police will be able to use their car’s registration number to track them down. 1) you will get a fine from camera only for +23 km/h (on september 1-10 every camera will take picture for +3km/h but wont sent anything unless you get caught twice), police almost never stop you for a less than +23 km/h of speeding. Thease speeds are ONLY for motorcycles and cars which weigh less than 3500kg and has less than 7 passenger seats. I’m getting closer to include Lithuania. But, as always, how is it it possible to make simple things like this so complicated? The best thing would be to include all the Baltic states in one update. Does anyone have any relevant information on Estonia and Latvia? Note that during roadworks fines go up. Thank you. I guess this is updated info on the Netherlands? for <2 year driving exp. 30-40 km/h – 115-173 euro and DL withdrawn for 3-6 m.
for <2 year driving exp. 40-50 km/h – 173-231 euro and DL withdrawn for 6-12 m.
50 km/h and more – 289-434 euro and DL withdrawn for 1-6 m.
for <2 year driving exp. 50 km/h and more – 289-434 euro and DL withdrawn for 12-18 m.
Thank You, Dmitry! Do these fines apply to all zones, ie. urban, rural, motorways? Do you know if there Is any source on Lithuanian traffic rules/police reactions in a language I might understand (english, german)? You are welcome! And many thanks for such a useful resource! In Lithuania there is no subdivision to rural and urban zones regarding fines for speeding. Important in Austria, exist a lot o speed cameras, sometimes you don’t see, are inside a metal box. But the big problem is at the autobahn’s, you need a 3D sticker installed at the left side, in the middle of your windscreen. The Sticker cost is 80 Euros and is valid until one year or 08 Euros valid until 10 days, the speed cameras find this stickers optically, if you don’t have automatically you will receive a ticket of 120 Euros(you can buy at the gas stations). Hi, good information, do you know if there is a website where I can check if my car (plate #) has fine pending to be paid? i.e. if I was speeding and a trafic camera took me a picture? I am interested mainly in Austria. well done with your site, bravo! Plenty of useful informations in a hassle-free, nice and clear design, with a lot of good sense and a bit of humour. It’s not so common, lately, in this dumb era of the internet. Finland: 80 km/h outside cities is true. 100 km/h is possible but marked separately. During the winter months 120 km/h is reduced to 100 km/h and also most of the 100 km/h to 80 km/h. A briliant site! Congrats! Drivers need it. It’s only a pity that you didn’t emphasize that in Germany there is still no general speed limit and there are places you can legaly see a ‘3xx’ number on your speedometer. I have a comment/correction for Poland for you. Can I have your email address? Thank You, Peter. Sorry I’m late with this response, this is my mail: terje@enge.no. And I thought that the message that Germany still has a no-limit speed was clear – it’s written in the subtitle.